The Scrap n' Stamp Shop: HANG YOUR STOCKING - Bells or Bling? HANG YOUR STOCKING - Bells or Bling? Hello Friends! I have been wanting to do something with the "Hang Your Stocking" stamp set since the minute it arrived. I know there was a similar stocking stamp set and punch a few years ago, but these stockings are so much bigger and so much prettier. I'm in the process of making some cute 3D items with them, but here's a couple of cards just to give you the idea. Do you prefer bells and a more traditional look or one with soft colors and bling? 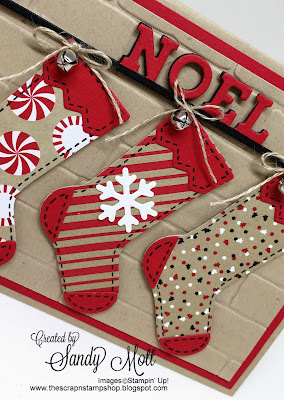 I used my favorite new Holiday paper - Candy Cane Lane Designer Series Paper and the "Hang Your Stocking" bundle (stamp set and framelit dies). I cut two of the mantle pieces - one in black and one in red and combined. To give the NOEL more of a 3D look, I layered it slightly off so some of the black would show. The stocking bows are Linen Thread. And here's the bling. 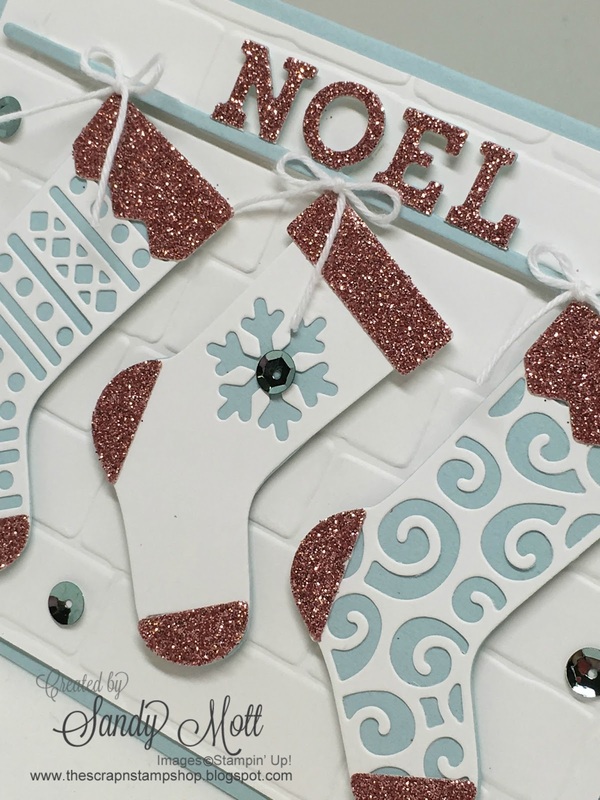 I used Blushing Bride glitter paper and Sky Blue cardstock. I also used the fancy stocking framelits to cut out the stockings. They are backed with Sky Blue cardstock and the bows are tied with White Baker's Twine. So which one is your favorite - traditional bells or bling? E-mail or call me to save your seat! They are both beautiful, but I have to say the 'blingy' one is my favorite. Thank you Lisa! I'm a bling lover myself! Oh my . . . I love both! Great job using the Brick Wall Embossing Folder for the back drop! Love that embossing folder! Thanks much Tonya! The Brick Wall is one of my favorites as well. As usual, both are great, but I like the more traditional ones!